Whilst we live in an age seemingly driven by the advance of technology, the concept of an analogue clock-style dial seems like something we should have surpassed years ago. So, for that reason we're slightly baffled as to why no one has thought of this product before. We'd love to see how many drum companies out there are slapping their foreheads at having missed this idea. Great price tag. Sturdy and easy to use. Digital display may be unfamiliar. Tuning gauges have been on the market for many years, offering drummers with a less than perfect ear for pitch a simple, effective and, most importantly, precise way of tuning their drums. Because they essentially work by visually displaying the tuning of your drums, aside from facilitating the quick tuning of your kit, they also enable you to tune to the same pitch each and every time. The main drawback and reason most likely to explain why you don't see these helpful things in every drummer's case, is their price. With most tuners approaching a wallet-abusing £100, most of us would far rather put the money towards a great new cymbal than something that doesn't even so much as make a noise. So why should we encourage you to give this particular gauge a look? Well, for one it's digital - something that hasn't been offered until now - and, an even better reason, it is very competitively priced. 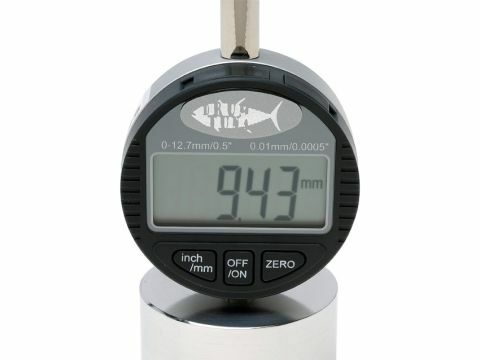 Much like other tuning gauges currently on the market, the Drum Tuna Flip features a large metal base, from the bottom of which a spring-loaded needle protrudes. The 'head' of the unit features a large LCD display, as well as three buttons for scale, power and zero-reset set into a dark grey plastic fascia. The relatively weighty mix of metal and plastic allow the Flip a rugged and durable build, which certainly feels strong enough to withstand long trips in even the clumsiest of drummers' hardware bag. And, if you are worried about breaking it, as well as the included instructions, it comes with a rather handy carry case. Using the Flip is incredibly straightforward. By placing the base of the unit on top of a drum and next to a tuning rod, it's simply a case of pressing the 'on' button and choosing your desired scale - either inches or millimetres. The display will then give you a reading, based on the resistance of the needle against the drumhead. You can then adjust the tuning with a drum key to achieve your desired sound. All that is left to do is to move the tuner around the drumhead as you would when tuning normally, matching each reading to the opposite tuning rod. If you're unsure of the kind of readings to use for each of your drums the Flip also comes with a helpful tuning chart, which lists a number of suggestions for varying sizes of drums and genres. One of the best things about the Flip is its competitive pricetag - whilst other drum gauges retail at anything from £60 to £100, the Flip comes in at an RRP of just £79.95 (as with all RRPs you may find it cheaper at point of sale), falling slightly cheaper than the current dial analogue-only versions on the market. If, however, you crave the familiar, the Drum Tuna Hero, an analogue version of the Flip, is also available from Drum Tuna at a competitively priced and considerably cheaper £54.95 (again RRP).